DVD (Digital Video/Versatile Disc) is a digital optical disc storage format widely used in the film industry. Though a DVD disc is capable of storing various files including videos, audios, documents, pictures, programs, etc. it's not the ideal medium as it can only be accepted by DVD players and DVD drives, and is difficult to preserve, share or enjoy on other devices. To convert DVD to Android supported format, Tipard DVD to Android Ripper can meet all your needs as it has the capability to convert any DVD to Android supported files with powerful editing features and fantastic video image quality. Download and install DVD to AVI Ripper. Then launch the software and insert the DVD disc you want to rip to Android into the DVD drive. Click the "Load disc" button to add the disc into DVD to Android Converter. For DVD ISO image file, you need to mount the ISO file into a virtual DVD drive first. For DVD folder, click "Load disc" dropdown button and select "Load DVD Folder" to convert VIDEO_TS to Android. Also you can load DVD IFO files in VIDEO_TS directory. After the DVD is loaded, you can choose any title or chapter that you want to convert by ticking the check boxes before them. You can convert DVD to Android container format with different encodes. What's more, this DVD to Android Ripper can directly convert DVD to specific devices such as PSP, Wii, PS3, Xbox 360, Archos, Blackberry, Creative, iRiver, etc. Before converting DVD to Android supported formats, you can optionally choose to customize the output video. 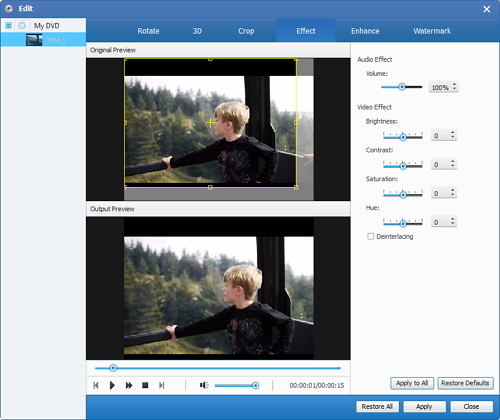 You can choose to adjust effect, trim video length, crop video frame, add watermark. 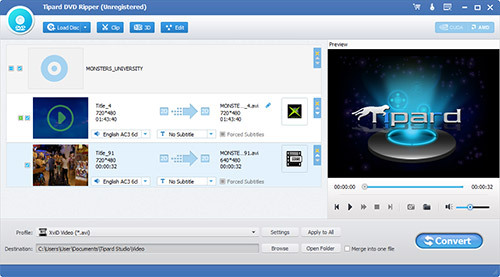 In order to get your needed effects, a preview window is offered on the right side of DVD to Android Ripper for you to view the video in real time. After the output settings are done, click the big "Convert" button on the bottom-right to start the DVD to Android conversion. This software supports batch conversion and in a short time, you will get your needed Android supported videos.